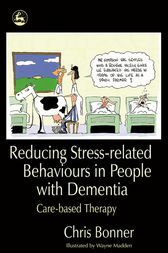 This practical book provides simple and imaginative ways to prevent and reduce stress-related behaviours in people with dementia in residential care. The author's approach is based on maximizing personal expression and fulfilment and recovering access to familiar, enjoyable and meaningful activities. He suggests strategies for managing common problems with feeding, bathing, toileting and sleep, looks at how to understand and cope with wandering, agitation and inappropriate sexual activity, and discusses ways of defusing aggressive behaviour. He also explains how to enhance care home environments and staff communication skills, and suggests a variety of helpful activities and therapies. Written in a clear, accessible style, this book will be an invaluable resource for residential care workers and the families and carers of people with dementia. Chris Bonner is a clinical pharmacist based in New South Wales, Australia, specialising in aged care. He provides consultancy and education services to nursing homes and has carried out extensive research into medication use in residential aged care facilities. He has a special interest in psychogeriatrics and has been a representative on a State Task Force on medication management in residential care facilities, a National Guideline Committee of the Royal Australian College of General Practitioners and a National Dementia Forum. He has recently been appointed Associate Professor at the Faculty of Health Sciences and Medicine, Bond University.